The Finance Ministry must base the budget on the price of $41 per barrel, or less than half of the $95-per-barrel estimate that is a cornerstone of the existing budget, Putin said in opening remarks to his Presidium. A Finance Ministry spokesman said the prices were for Russia's main Urals blend. The oil industry, which provides 40 percent of budget revenues in taxes and export duties, is reeling from the economic crisis that is ravaging markets worldwide, pushing demand - and prices - down. The Urals price averaged $42.90 in the first 16 days of this month, Economic Development Minister Elvira Nabiullina said. If oil sells for $41 per barrel, consumer prices will grow 13 percent and the U.S. dollar will strengthen to 35.10 rubles, Nabiullina said. The ministry will revise its estimates for budget revenues and spending based on these figures, she said. The current budget has a surplus of 1.9 trillion rubles. Spending is projected at 9 trillion rubles. The Kremlin's top economic adviser, Arkady Dvorkovich, said in an interview published Monday that the government expected a budget deficit of at least 5 percent of the year's gross domestic product. He didn't provide the figure in rubles. Dvorkovich was more upbeat on inflation, saying it would decline to 12 percent at most from last year's 13.3 percent. Reacting to slumping demand, prices have already begun sliding for commodities and construction materials, he said in the interview to Expert magazine. 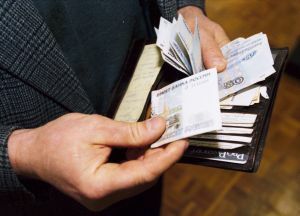 The budget deficit could range from 5 percent to 7 percent of GDP, said Yelena Lebedinskaya, a budget analyst at the Economic Expert Group, a think tank. Tatyana Orlova, an economist at ING Bank in Moscow, said a deficit of 5 percent of GDP would mean 2.3 trillion rubles. She based her calculation on the bank's assumption that GDP will decline by 0.2 percent this year. Finance Minister Alexei Kudrin, speaking at a financial forum in Hong Kong, predicted Monday that the economy would post zero growth at worst or grow by a modest 2 percent at best this year. The economy swelled by 6 percent last year. The government will finance most of the deficit by dipping further into the Reserve Fund that has been sponging windfall oil and gas revenues since 2003, Lebedinskaya said. The fund held 4 trillion rubles as of Jan. 1, or $137 billion, the Finance Ministry reported last week. "There will be borrowings, but they won't be large," she said. Some of the Reserve Fund has already been slated for spending. In November, Kudrin announced that the government would spend 1 trillion rubles this year from the financial safety cushion as a result of the global economic crisis. "I believe the size of possible spending out of the fund has grown since then," Orlova said. She added that Russia's relatively low sovereign debt allowed the government to indulge in borrowing on the market despite the high cost of doing so in an economic crisis that sent the rates soaring. Kudrin said last week that his ministry would submit budget amendments in February. Despite the likely drop in federal revenues, the government will increase aid to banks by another $40 billion in the near future after earlier allocating a similar amount toward bank liquidity and capitalization, Kudrin said Monday. "I think we will have to increase that amount by this much in the near future," Kudrin said, Vesti-24 television reported. "We are maintaining and will maintain stability of the banking system. There are the necessary resources for that."